If Alaska is anything like HGTV makes it out to be, it’s a beautiful, serene landscape full of glistening glaciers, towering spruce trees, and vast lakes. There’s one fact HGTV left out, though: Sometimes horrifying monster fish fall from the sky. KTUU reports that eel-like fish called Arctic lampreys have rained down from the sky on several occasions, landing on neighborhood lawns and freaking out anyone with eyes. The jawless, parasitic fish lives by attaching itself to another fish and feeding off its body. Worse yet, lampreys look like a human eyeball suspended inside a set of circular fangs. The Alaska Department of Fish and Game speculates that the disgusting eel rain may be thanks to gulls fishing the lampreys out of the ocean, then dropping their carcasses onto lawns. 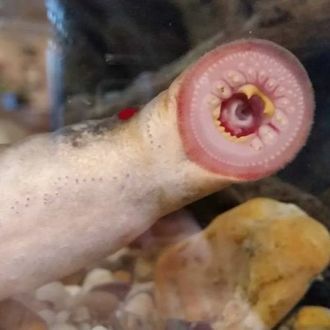 The only good news here is that lampreys die soon after spawning, so any glimpse you may catch of one of these horrific monsters will be blessedly brief.